The last of four posts written for “WWI and Champaign County” of the Town & Gown Speaker Series, a collaboration between the Student Life & Culture Archives and the Champaign County Historical Archives. Research for this post contributed by Maggie Cornelius. 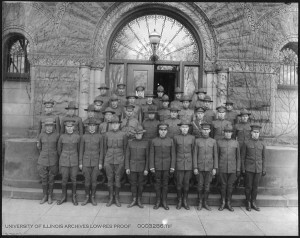 Besides ROTC and SATC, the Department of War instituted another military training program at the University of Illinois during World War I. The School of Military Aeronautics (SMA) was not a permanent addition to the University, but its activities preoccupied the campus during the latter years of the Great War. The third of four posts written for “WWI and Champaign County” of the Town & Gown Speaker Series, a collaboration between the Student Life & Culture Archives and the Champaign County Historical Archives. America’s entry into World War I required the mobilization of the country’s brightest minds and ablest bodies for military training and leadership. The War Department looked to American universities to recruit capable men for its military departments. 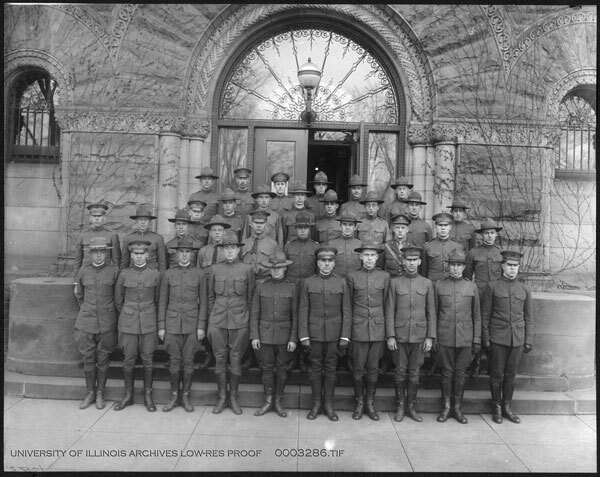 These recruitment efforts prompted the establishment of two prominent military organizations at the University of Illinois, both of which served as the foundation for the current Illini Reserve Officers’ Training Corps (ROTC) program. The second of four posts written for “WWI and Champaign County” of the Town & Gown Speaker Series, a collaboration between the Student Life & Culture Archives and the Champaign County Historical Archives. This year marks the 70th Anniversary of the Allied Invasion of Normandy. Memorial services for the war’s causalities are taking place around the world. These services commemorate the dead and also attest to the scope and ferocity of the Second World War. Those who liberated concentration camps felt it was of utmost importance to ensure that this history was kept alive. One of four posts written for “WWI and Champaign County” of the Town & Gown Speaker Series, a collaboration between the Student Life & Culture Archives and the Champaign County Historical Archives.